Our Christmas preparations are now in full swing and the Christmas shopping has begun. All of my children have written their gift wish lists, that were expertly created by each of them with the use of endless toy catalogues, multiple trips to the shops and some online reviews. I rely a lot on reviews to help me make an informed choice about which products I would like to buy and determine whether a toy is actually as good as it looks in a picture or on an advert. Therefore, over the next few weeks, I am going to be sharing our own reviews on some of my children's favourite toy products out on the market at the moment and I hope that you will find these useful in the run up to Christmas. You may have seen me mention previously, that my son Riley has a love for vehicles. It doesn't matter what kind of vehicle, as long as it moves and it can be used to create a story or a little town based around one of his road rugs. Cars, trains, planes, boats, quad bikes, helicopters, diggers, you name it, I can pretty much guarantee he will have one in his collection. 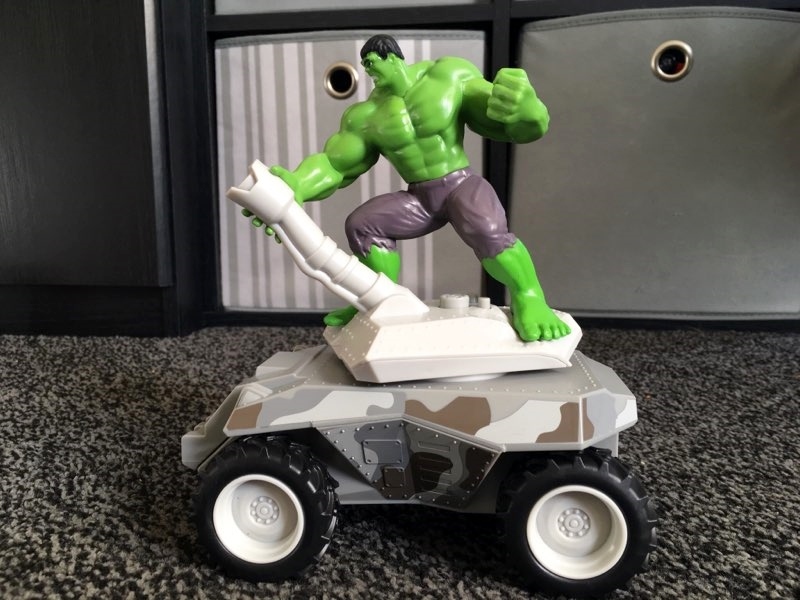 He is a big fan of imaginative play, so he uses his vehicles to create pretend scenarios where he can also introduce some of his favourite characters and get creative with his toys. 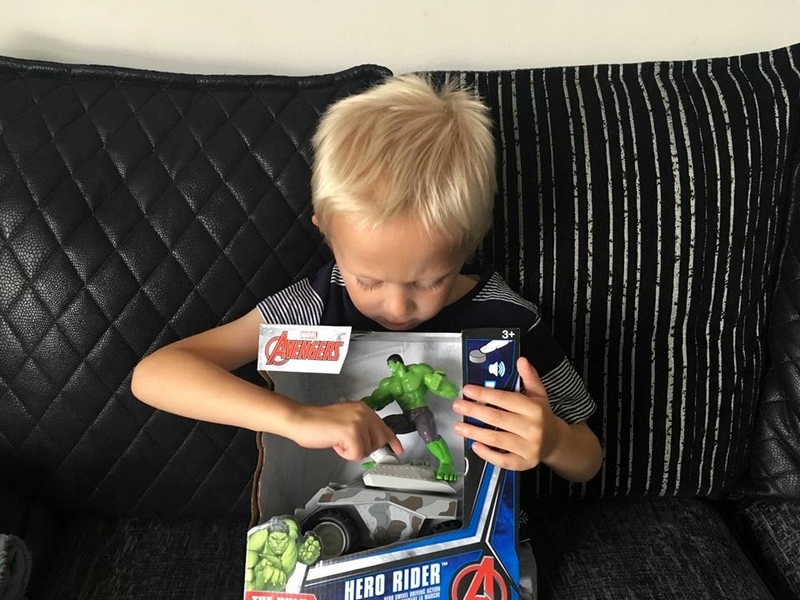 He was therefore delighted, when we were recently sent the Marvel Avengers Hulk Hero Rider™ by Toy State, as this incorporates one of his favourite Marvel characters riding a truck and has the benefit of a character and a vehicle in one toy. The product came nicely presented in an open front box, so you can see exactly what you are getting before purchasing. This also gives access to the buttons on the top, so you can also hear the sounds that the toy makes. 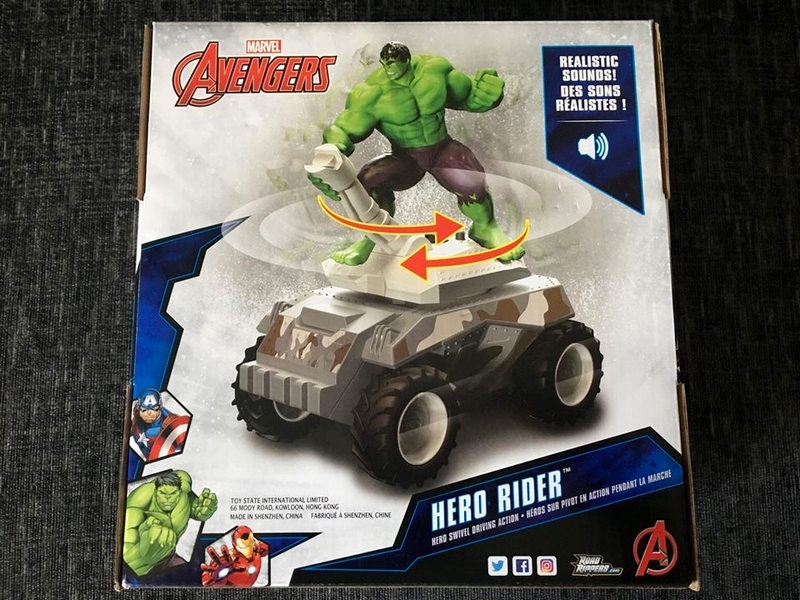 The box describes the toy has having a Hero Swivel Driving Action which is also highlighted on the side of the box, using graphics to show that the figure on the top of the truck can move from side to side. There is also an age recommendation of 3 years+. The box was very easy to open and I was pleasantly surprised to find it very simple to detach the Hero Rider™ from the packaging. It is one of my pet hates at Christmas when the children want all their toys open, to find that you then need about twenty different tools just to get the product out. This item has a very simple twist and pull mechanism though, so Riley was able to have the toy out of the box in less than a minute. Another huge bonus for us, was that batteries were already included in the product. It does state on the bottom of the box that these are included for store display purposes, however Riley has played with this toy regularly over the past two weeks and they are not showing any signs of running out just yet. 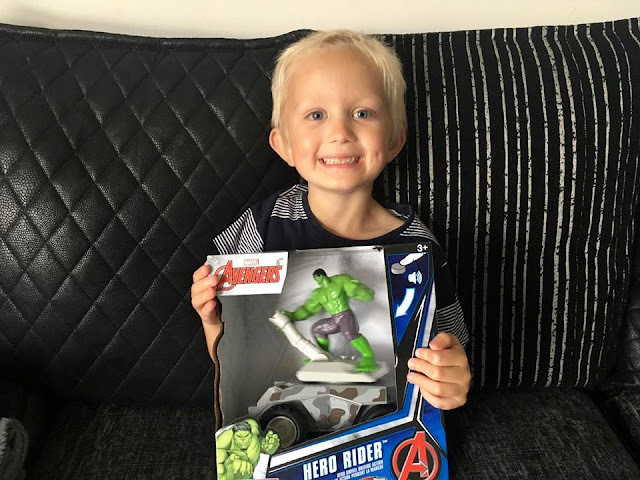 Riley found the Hulk Hero Rider™ to be very straightforward to use and was able to push it along manually, or alternatively, he could press one of the buttons which would then allow The Hulk to power the vehicle. We have had a couple of similar toys in the past and found that sometimes these kind of toys only work well on hard floors such as laminate or tiles, however, this one flies across our carpet with no problem at all, which was a big plus point for me. This means that Riley isn't limited to where he can play with it and it is suitable for all the floor surfaces in our home. When you press the buttons on the top of the The Hulk Hero Rider, this also activates some great sound effects which include Hulk noises and music. The buttons also make The Hulk move from left to right as he controls the vehicle at speed. The product dimensions are approximately 19cm in height, 10cm width and 17cm depth. This makes it a really nice sized toy to play with as well as being the perfect toy to store away with ease. It is chunky and well built, ideal for small hands and more than capable of withstanding the toddler test. Overall I have found this to be a really good quality product, which Riley thoroughly enjoys playing with. 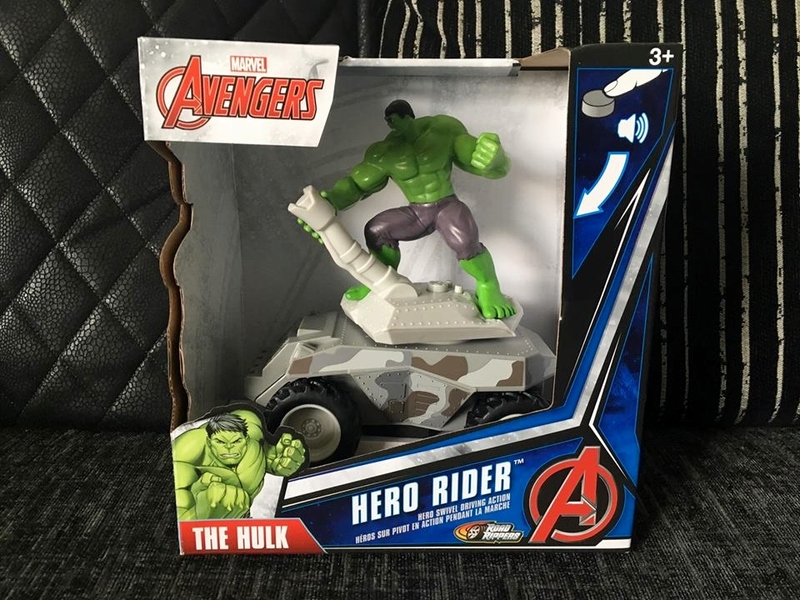 There are a couple of other Hero Rider's available in the range, so we are thinking of purchasing another so that we can have Hero Rider™ races and see which vehicle can move the quickest. The RRP of the product is £22.99 which I think is a reasonable price for a Marvel themed product that offers several play options. The product is currently available to buy at Argos and further information can also be found on their product page. Disclaimer: We were provided with this product on a complimentary basis, for the purpose of providing an honest review and opinion.